Marketing and publicising your book can be one of the hardest parts of the publishing process, but also gives indie authors and publishers scope for creativity in their approach. You should always research your target market before publishing your book. Ask yourself the following questions and answer them honestly. Is there a viable market for you book? Who is your target market? At the end of the day, customer is king. Does your book fill a gap where there is demand? Does it satisfy a passing trend, or will it continue to be relevant in the future? Market research doesn’t only make you question your own intentions, but also gives you a broader knowledge of your market. Fully understanding the market of which you are trying to break into will give you a huge advantage when writing your business and marketing plan. So, where can you carry out this research? A really valuable thing to do is to speak to publishers. Not just publishers that specialise in the same genre as you, but to a wide variety as they will be in a better position to offer advice from a business perspective, rather than subjectively. Contact as many as you can because not all of them will open their doors because essentially, you are their competition in an already saturated market. The publishers that do open their doors to you will be able to offer invaluable advice. Whilst you’re at it, speak to other authors, agents, printers and suppliers. Booksellers are your best friends. They know the market like no other part of the industry does: the book shops are the gateway to your readers. They know what sells and what doesn’t and they may know a lot about the particular market that you are trying to establish yourself within. Developing a relationship with your local bookseller can be extremely valuable to your cause: go in and meet the store manager because they are the people that are responsible for the books that their bookshop stock. Start with your local independent to get a feel for it, and work yourself up from there. Keeping in touch with what’s going on in the publishing sphere is crucial – this is where you will find all of the industry trends and gossip. The Bookseller, Bookbrunch, Book2Book, Publishers Weekly are just a few of the ways that you can keep connected with what’s happening in the publishing world. Subscribe to anything that is specific to your area of publishing and make yourself the expert. These are just a few of the ways to begin your market research. Don’t be daunted by the research and planning side of publishing and don’t let it get in the way of your writing – see it as a way of enriching your book. Writing the business and marketing plan for your book, aside from writing the book, will be the most time consuming part of your project. Putting down the building blocks of your books route to market, on paper, is essential. Keep it structured and realistic and it will help to keep you on track. At times you will feel like you are juggling so many things that you don’t know where to start but a good business and marketing plan will help you to stay focussed. Keep it succinct, realistic, and factual. In this section you should summarise your business plan, giving an overview of your manuscript to market process. This is where you dazzle even yourself with your books strengths and weaknesses, market competition, opportunities and threats, all of which you will know from all of the market research that you have carried out. Remind yourself and tell others why readers are going to buy your books over your competitors with a strong outline of your book. How are you going to sell your book? Who are your customers? Is your audience demographic specific? How will you attract and retain enough readers to make a profit? What methods will you use to capture your readers? What sets your book apart from the competition? How are you going to get your books into retailers? This is the where, what, when and how section and will be the most important part of the business plan. Give yourself clear objectives as to how exactly you are going to reach your readers – it can be as wacky or as simple as you like but be thorough. This section should detail the technicalities of how you are going carry out all of the objectives in your business plan. Here you should outline supplier details. Who will be printing your books? Who will be distributing your books? Are you having any professional help with publicity?….And so on. Without finances in place, it is difficult to establish whether you can even afford to pursue with your project. You will need capital behind you in order to fund professional publishing services such as editorial, design, marketing, publicity, and printing. Create sales forecasts and budgets to stick to that are realistic and not based on feelings and hopes of what you would like to happen. Base it on fact with profit and loss accounts for the first year, and a summary for the second and third. You should also do a risk analysis so that you are prepared if something doesn’t go exactly to plan. Financial forecasting will provide an idea into how your market and the strategies that you plan on implementing will play out. Be strict and stick to it. Twitter: Twitter is a platform which allows you to “tweet” 140 characters. This works well for snappy posts, posting links and pictures, and is a place where you can be reactionary to news and other tweets. General advice is to post 80% interesting and engaging tweets that will appeal to your target audience, maybe about topics covered in your book, and then 20% marketing. A feed full of “buy my book” tweets may be off-putting to your potential readers. Facebook: You can now create a professional page (an author page) on Facebook, which you can keep separate to your personal account. Facebook is a great place to post longer content, not quite as long as a blog post, but more informative posts on your book and thoughts. Instagram: Instagram is a visual social media platform – you can share images, which could be perfect if you are publishing a photography book or a book on a visual subject. It is also a great way to share pictures of your cover, the book and your book if you spot it on the shelf of a bookshop! Pinterest: Pinterest is another visual image sharing platform, where you can upload images and also pin images. You can create boards, so can separate images by different topic or genre. Lots of people use Pinterest to create inspiration boards. Youtube: Youtube is a site dedicated to videos, so if you have the skills to film and edit videos, this can be a great option. It is also a good place to post a book trailer if this is something you are looking to do. Blog: Blogging is a great way to create engaging content that will also lead readers to your book. There are several different sites on which you can create a blog, and you can post as regularly as you like. The great thing about blogging is that you can share audiences with other bloggers once you have become part of the wider blogging community, with collaborations working well. If you are unsure about having your own blog and are worried about posting regularly, then there are often opportunities to guest blog. Author Website: An author website can be a great tool for showcasing your books and can be an easy way for your readers to find you. There are many different sites that will let you create a website using ready made templates which are very useful. Unless the book is going to part of a series, or has a wider context (a book written for a particular cause or organisation) then it is best for the website to be author focused so that you can post information about all your books on one site. If you are publishing under an imprint, then it is best for the imprint to feature in the domain name. Although there is often overlap, each platform will give you a different audience with which you need to engage differently with. Content that works well on Facebook might not translate so well on Twitter and vice versa. Although it is good to have a presence on multiple platforms, make sure you are not too stretched. It is better to have one or two that work really well, than ten that you don’t have the time to build and grow. If you have any planned publicity in which you have forecast a significant rise in sales, please could you let us know in advance (two weeks beforehand if this is possible), so that we can contact Gardners to ask if they could hold more stock. If you have a publicity document with this information that we could send through to Gardners, please send this in to us. Discoverability. Even the most successful traditionally published writers obsess about it. You’ve written the best book you can, one you are hugely proud of. But how does anyone know it exists? Whether you’re going DIY or are planning on engaging with specialist freelancers and agencies, the earlier you start the planning process, the better. Initially, it could just be thinking about your existing network and who would be likely to review and endorse your publication. Who will help you promote and spread the word to others when the book is ready to buy? A successful marketing campaign will almost certainly involve setting up the right social media platforms for you in the run up to publication. You’ll want to create as many assets for these as you can, whether they are blogs or quotes or video content. You may want to create a website or think how people will most easily find you and your book once they start searching. Picture it as a process of creating a toolbox to support the amplification of your book pre and post publication. You never know when the accumulative affect will start translating into a visible spike in sales. If you are going to be handling your own PR, your timeline should mirror a professional’s although you’ll have more flexibility after the book has released. If you are going to to engage with a dedicated PR specialist, they would ideally come on board 6 months prior to your publication date. They will begin working with you by honing the pitch, formulating a PR plan pre and post publication, and agreeing on suitable targets in the media and for future events. 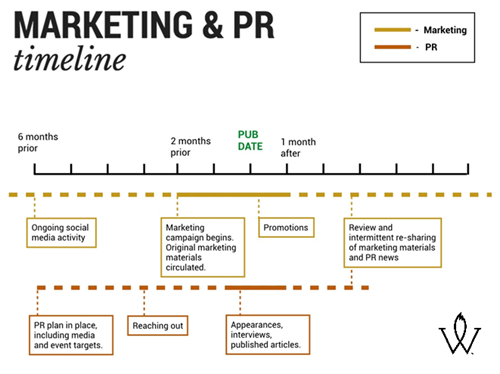 After publication, your PR team will typically stay working with you on the book for two weeks proactively, and one month reactively. The key to both marketing and PR is to wholeheartedly embrace it. It is highly unlikely that there will be one silver bullet that propels your book towards the bestseller lists. Much more likely is seeing the accumulative affect of increasing, ongoing awareness and endorsement. Don’t forget about discoverability. And that can happen at any time. If you would like us to put you in touch with whitefox, please contact us.